Barking dogs and crowing roosters serenaded us on the afternoon we arrived to Hotel Al Mulino through the bougainvillia hedges and grape trellises of Anacapri. The hilly village rising over Italy’s Island of Capri may be Edenic, but all I could think about was the bad night’s sleep that awaited this big city girl. Thankfully, I was wrong. The restored 19th-century mill owned and managed by Antonietta Viva and her husband is made of sturdy stuff, and once we lowered the heavy blinds, a radio silence descended on our room. The only real noise to disturb us came from CNN on our TV -- and from our chats with Antonietta, whose twinkly-eyed warmth and down-home hospitality alone should earn the three-star establishment a ratings boost. Al Mulino is a country home wreathed by private gardens and stone facades, and when the sun naps them in gold, you grasp why Mediterranean clichés aren’t worth resisting. The leafy idyllia is not only a salve for sore eyes, its fruit groves supply the fresh orange juice of your breakfast and fig and apricot reinforcements for your day about the island. Roman Emperor Tiberius also liked the spot. He staked out Damecuta a spit down the road as the site of one of his villas, and you can poke around the ruins before heading out to the azure waters of the aptly-named Blue Grotto below. A fifteen-minute walk to Anacapri’s San Michele Church with its Adam and Eve mosaic floor, another five minutes to the main square of Piazzetta Victoria and maybe ten more to the home, museum and gardens of Swedish writer Axel Munthe, Al Mulino is just far enough from and near enough to the action to make it the perfect getaway. For guests who are less charmed by rustic hikes, the hotel runs a shuttle service. Each of Al Mulino’s tastefully appointed seven rooms gives onto a terrace, where guests can slurp a sweet lemon “granite” or simply breathe in the ridiculously clean and fragrant air. Antonietta herself designed the interiors, modeled after typical Caprese villas in shades of blue and white. The hotel also has communal spaces – a small restaurant, snack bar, adult and kiddie pools, solarium and pathway to the beach. 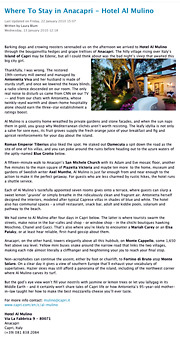 We had come to Al Mulino after four days in Capri below. The latter is where tourists swarm the streets, make noise in the bar-cafes and shop – or window shop – in the chichi boutiques hawking Moschino, Chanel and Gucci. That’s also where you’re likely to encounter a Mariah Carey or an Elsa Pataky, or at least hear reliable, first-hand gossip about them. Anacapri, on the other hand, towers elegantly above all this hubbub, on Monte Cappello, some 1,650 feet above sea level. Yellow mini buses snake around the narrow road that links the two villages, making each ride almost literally a cliffhanger and heightening your joy to reach your final stop. Non-acrophobes can continue the ascent, either by foot or chairlift, to Fortino di Bruto atop Monte Solaro. On a clear day it gives a view of southern Europe that’ll exhaust your vocabulary of superlatives. Hazier skies may still afford a panorama of the island, including of the northwest corner where Al Mulino carves its turf. But the god’s eye view won’t fill your nostrils with jasmine or lemon trees or let you lallygag in its Middle Earth – and it certainly won't share tales of Capri life or how Antonietta’s 95-year-old mother-in-law taught her how to make the best mozzarella cheese you’ll ever taste.